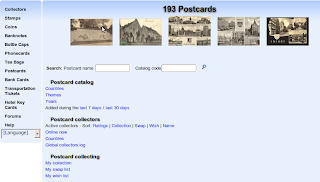 We are happy to announce the launch of yet another category to Colnect's catalogs: postcards. This addition offers our collectors an even wider variety of collectibles to choose from in managing their collections and finding others around the globe to exchange with. It also closely follows last week's expansion into bank cards, hotel key cards, and transportation tickets. The postcards catalog, which presently features a couple hundred items from France and Germany, was made possible through the dedicated efforts of Paul Giba [CarnivorousVulgaris] . Feel free to check it out if you or someone you know collects postcards! As always, Colnect is grateful for the continued support of all its volunteer collectors who make these catalog improvements a reality. If you're an avid collector in one of these new categories, any assistance you could provide to help expand the catalogs would be most appreciated. We also welcome any suggestions you may have for future collectible categories to be added! Colnect has the world's biggest phone card catalog, with over 200,000 currently being displayed! Colnect also features tens of thousands of items in our stamp catalog, coin catalog, bank note catalog, and bottle cap catalog. In addition, our newly-created tea bag catalog is growing rapidly and now has nearly 2,000 items from 43 countries displayed.